This being the first M^5Wire, my observations will be exceeding broad. Bitcoin’s dominance remains, but other top chains are more significant outside of their circle of bloggers. BTC still dictates the direction of the market. And as strong as its influence is, other blockchains seem to have enough support from established business that they could survive on their own. Blockchain technology seems to be have established itself in the boardrooms of corporations, as such to warrant its own department or techies in the very near future. In an effort to avoid opinion, simply put, blockchain is increasingly on the tongues of executives in regular business headlines. IBM has openly taken a lead here with chatter of a World Wire… will “blockchain logistics” be top words this year, or next? Speaking of private blockchains and not necessarily crypto, Ethereum and Amazon are increasing their activity. EOS news has been less aggressive than Ripple as both tread water among the top currencies. This is where Litecoin is interesting. Are investors looking to support the lead of Bitcoins while minimizing The Lightning Network (LN), and could Litecoin even make this possible? Will LN smart contracts compete with Ethereum? Then there is Binance Coin (BNB). The big question here is does BNB offer the needed functionality of a blockchain-based settlement layer for an exchange? Or will BNB found ineffective and a passing fad? BNB must warrant attention because of its significant outperformance of Bitcoin. 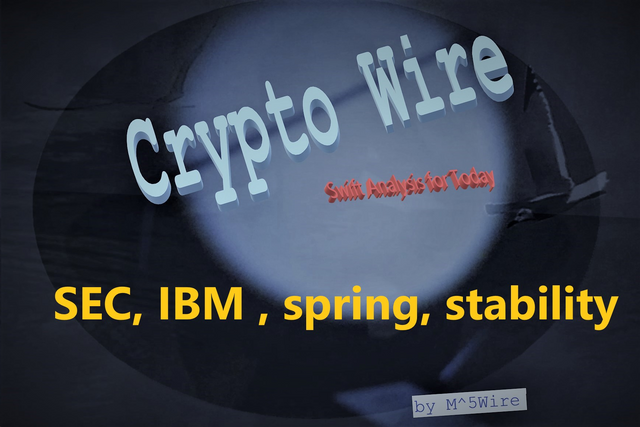 If you daily peruse crypto headlines… well I warned you.. this post is just so the M^5Wire can get some footing. So just a real quick comment of headlines running on the wire. *RESILIENCE*: amidst the entrance of corporate goliaths and popularity among daring businesses are people who have found success. Discussions about trending ICOs have shifted to solutions that make a difference both for a company and on personal levels. And how about this US SEC Schedules Public Forum on Blockchain and Cryptocurrency for March 31, 2019. *Please see Purpose of M^5Wire for more information. Hope you enjoyed this flyby. Comments are welcomed, and through this platform, I can assign value to your meaningful thoughts!